← FP Tshirts are here! We had never heard of Ape industries before, but suddenly we saw a message on facebook about a location called preventatorium. 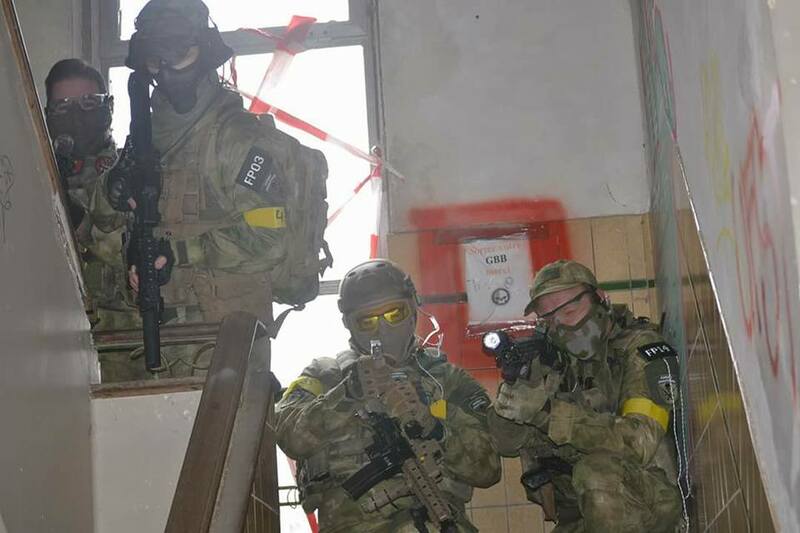 Mega CQB? What the hell did that mean anyway. We were only 4 today but that did not keep us from killing it! Carlos, Rubel, Samuel and myself knew from the start we had a super squad. The terrain was amazing. Everywhere there where tables to put your gear, the building itself was great and full of graffiti. A gang of nice chicks from the organization made sure everything went smooth. I can only say this day and place where awesome. We were part of team yellow today. Yellow spawned all the way on top of the building. The elevation was very steep. GO! Our team rushed down and was able to pin the other team down at the bottom and flank them in their backs. Badass. Every player got a yellow or red card that the opposition had to acquire. Upon death, the player had to hold up the card for 15 seconds and if you were able to reach the player, you got the card. Within 10 minutes, the Phantoms had already collected about 15 cards. From that point, onward it was on to exploring the terrain. From room to room and floor to floor. The yellow team broke through all opposing forces. After this winning streak, they moved us to the basement so we had to work our way up, but even that didnt help. The maze of rooms, hallways, corridors and stairs was sometimes very confusing as we were clearing the rooms tactically. Luckily because we stuck together, our team performed great. In the afternoon, there was a mission in which you had to charge a cellphone, enter a pincode and cellphone number and find a text message. Very cool! We had all components except the message but then we were moved to team red for balance. But… team red didn’t even have the cellphone yet so we had to start over. After half an hour of pushing and pulling, we had all components and made sure team red had their first win of the day. During the last mission team yellow had to put 3 wounded on a stretcher and get them back in the base. (We are now on team red.) They didn’t even get close thanks to FP’s tactical set-up. All in all, a great day! Amazing location and great organization. As always it was great to be on the best team. FP all the way.